The island of La Palma is off the usual beaten track – it is an island for nature lovers and adventurers. Known for its tranquility, beauty and amazing walks, it is without doubt a paradise for every walking enthusiast. With around 1000km of trails on the island, the walker is spoilt for choice. However, you can be sure that our walking holidays include some of the most beautiful and awe-inspiring trails on La Palma, such as the historic GR130 Camino Real, the volcano route and the UNESCO laurisilva forest. If you have particular routes or requirements in mind, then we can offer accommodation to suit your walking holiday. Using our local knowledge and experience, we will build a holiday just for you. * The routes we use comply with both the ERA and FEDME (European Ramblers Association and the Spanish Federation of Mountaineering and Climbing). A seven-day walking holiday including a trek through the UNESCO sub-tropical rain forest of Los Tilos and the ancient donkey trails of the GR130 Camino Real, the Walk of Kings. With four/five different lodgings along the way your luggage is transported for you, ready and waiting at the end of your walk. Spend three days in the rural north of La Palma walking the historic GR130 Camino Real and four days in the south west walking famous trails such as the volcano route, the Caldera de Taburient. And while you're there, you might like to spend some time at the beach or on a dolphin watching experience. La Palma is a great island for those who even slightly enjoy active holidays - getting out and about to enjoy the nature and beauty that surrounds us. La Palma has never been an island to set about attracting mass tourism and this has paid dividends as the island is largely unspoilt with some of the most dramatic and varied scenery in the world. Due to its history and being a mountainous island, there are numerous donkey paths and walking routes on La Palma which criss-cross each other and connect hidden hamlets, villages and towns. This is after all how shepherds with their goats, muleteers with their laden mules and islanders in general travelled from one place to another. In recent years, the island government has invested huge resources in clearing and maintaining these many paths and tracks on the island so that they are suitable and safe for walkers. These routes are now clearly marked with either signposts or blazes as approved by the ERA (European Ramblers Association) and the FEDME (Federación Española de Deportes de Montaña y Escalada). PR (Pequeño Recorrido) or Short distance walking footpaths (the trail can be walked from end to end in one day). 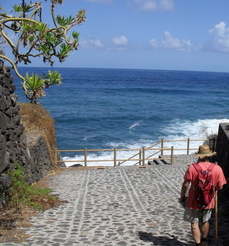 La Palma has 19 principal and 23 secondary PR's footpaths. GR (Gran Recorrido) or Long distance walking footpaths (take more than a day to walk). There are just two long distance trekking routes on La Palma, the GR 130 (El Camino Real - The Royal Way or Ruta la Costa - Coastal Route) and GR 131 (El Bastón - walking stick). The GR 130 Camino Real, or Royal Way, is a circular route which goes right around the peripheray of La Palma and is approximately 150km long. It can be walked in long or short sections - by walking about 5/6 hours a day, the whole route takes around eight days. The walking is quite arduous due to the many valleys and ravines but the views are completely exceptional.